Syracuse, NY. Euclid Terrace. Entrance from Eculid Ave. Photo: Samuel Gruber 2017. Syracuse, NY. Euclid Terrace. Entrance from Eculid Ave.Photo: Samuel Gruber 2017. Syracuse, NY. Euclid Terrace. "Village Green." Photo: Samuel Gruber 2017. Residents of Syracuse's Westcott and University neighborhoods know that despite the organizing principle of the orthogonal grid, there are many urban nooks, crannies, and irregularities to be discovered tucked into, over, or between the straight streets and ninety-degree corners that define the area. The imposition of the grid by various developers at the turn of the 20th century had to take into account a few earlier irregular roads and the many drumlins in the area; those geological lumps and bumps that dot the East Side landscape. One secret spot is Euclid Terrace, designed as a bit of English Village hidden just a stone's throw from the busy intersection of Westcott Street and Euclid Avenue. Whether you are picking up a six-pack at Grabby's, attending a concert at the Westcott Community Center or church at Erwin Methodist, you might not even know you are right next to Euclid Terrace. While some of the houses have property lines along Westcott, these houses turn there backs to the hustle-bustle, and the sidewalk lies at the bottom of a steep slope. Euclid Terrace as seen in the 1924 Hopkins map. You can see the south part is developed, but not the "Village Green". Euclid Terrace sits atop a small drumlin on the east side of the 700 block of Westcott Street and the west side of Strong Avenue between Clarke Street on the north and Euclid Avenue on the South. This high point remained vacant as lower flatter land on all sides was platted and developed in the late 19th and early 20th centuries By 1908, for instance, the east side of Strong Avenue (originally part of a continuous South Beech Street), was fully developed with eleven houses, but nothing was built either into or on top of the hill on the east side. But in the 1920s the parcel was developed into a picturesque cul-de-sac. This type of planned space is unique in the Westcott neighborhood, though it recalls Westminster Place, developed as a street and small circular part nearby atop another high point. Syracuse, NY. Euclid Terrace. Photo: Samuel Gruber 2017. While today Euclid Terrace has a variety of house types encircling its central round about, it is most known for its collection of small unique English cottage style houses developed by Joseph Lane & Clifford Goes in the 1920s. The west side of Strong Avenue, the location of what is now Euclid Terrace, was owned in the early 20th century by Mary Barber and was undeveloped. 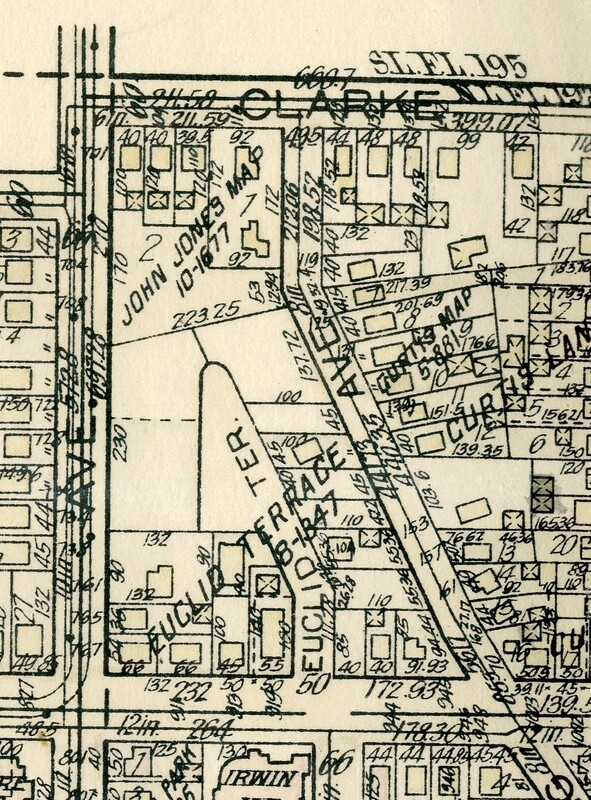 Barber also owned a larger tract south of Euclid Avenue. This small tract of Euclid Terrace was platted and filed in the spring of 1911. Located on the north side of Euclid Avenue, this triangular tract was bordered on the west by Westcott Avenue and on the east by Strong Avenue which angled from southeast to northwest; it bordered to the north on a large lot that also fronted on what is now Clarke Street. 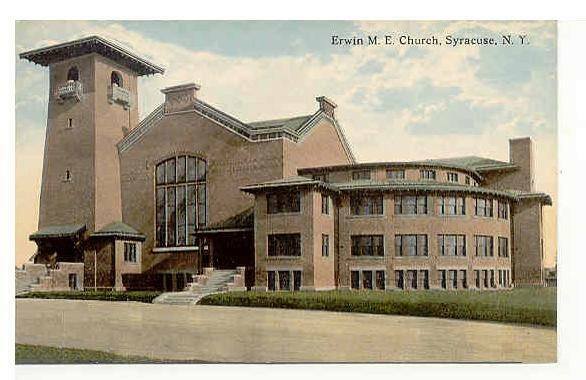 No doubt the opening of Erwin Methodist Church across Euclid Avenue in 1914 brought greater visibility to this almost invisible and inaccessible parcel. Syracuse, NY. 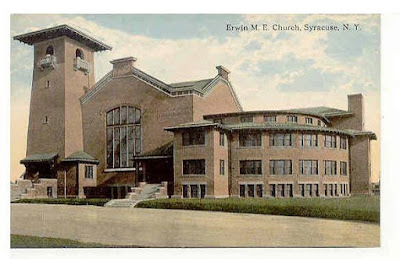 Erwin Methodist Church at Euclid Ave. and Westcott Street, original design by Justus Moak Scrafford, 1914. The Euclid Terrace tract remained undeveloped through the 1920s, and a revised plat was filed in late 1920. The revised tract included a more auto-friendly turn-around at the northern end of the access road, now Euclid Terrace, with two lots on the east side and five lots on the west, three of which backed up against on Westcott Street at the northeast corner of Euclid Avenue. This revision inaugurated the development of the new single-street tract, which took place through the 1920s. Syracuse, NY. 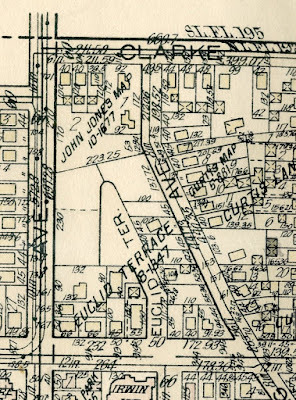 Euclid Terrace tract map, 1911. Syracuse, NY. Euclid Terrace tract map, revised 1924. The southern portion of the tract was developed first, and by 1924 included six houses that fronted on Euclid Avenue and one that fronted on Westcott Street. The northern portion of the tract was subdivided into building lots through the 1920s, and by 1938 almost the entire tract had been developed, including more than 20 houses. Its location, close to a major intersection and trolley line but set apart as a new almost private cul-de-sac, would have had great appeal in the 1920s as it still does today. As an advertisement 1927 noted, the Euclid Terrace tract is “Located in the smartest and most beautiful residential section of University Hill...a highly restricted colony of artistic homes.” These homes, the advertisement continued, possess “the usual Land & Goes ultra-modern features.” It is not absolutely clear what "restricted" meant in this sense, but besides the specific message of exclusiveness, it probably literally meant that sales were limited to whites, and possibly Christians. We do know that Scotthom which was developed at about the same time refused people of color, but did allow Jews. The Euclid Terrace remain something of an anomaly in Syracuse today. This type of scenic planning and the emphasis on English styles was, of course, developed further but on a much larger scale in the garden communities of Sedgwick, Berkeley Park, Scottholm and Strathmore, but small picturesque developments are rare. 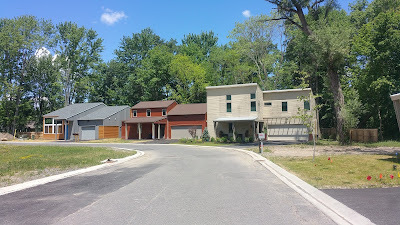 The use of the cul-de-sac and round-about as a residential neighborhood tool, however, became standard fare in the development of post-Word War II suburban housing tracts and it continues to be popular today. Syracuse, NY. Xavier Woods. 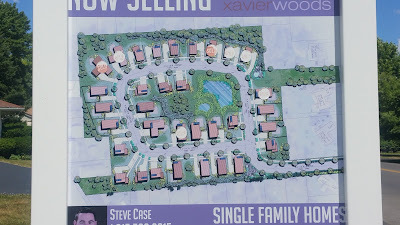 Development plan on sign. Photo: Samuel Gruber 2017. 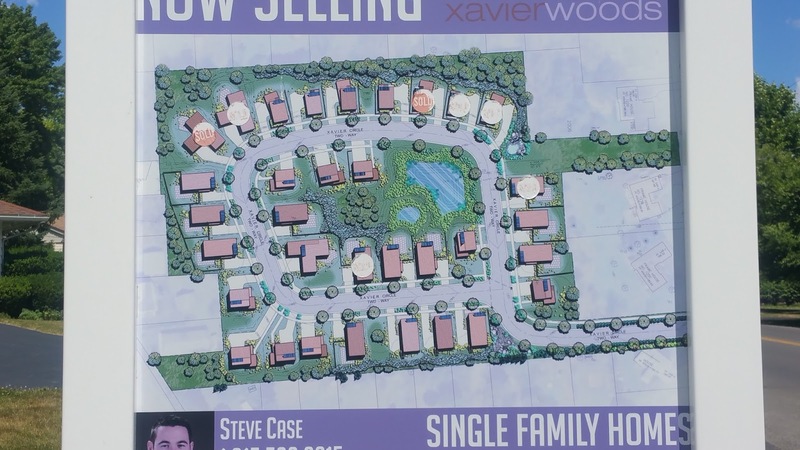 One modern application of Euclid Terrace concept is the still-in-progress development of Xavier Woods off of Comstock Ave. There a modern version of upscale developer-approved tract housing is a being built around a central green, in the way that almost a century ago, Euclid Terrace was developed. I'm all for new development in the city. But for me, if I had to choose which urban "village" to live in, it would be Euclid Terrace hands down for style, location and convenience. (Thanks to Bruce Harvey who contributed information and maps about the 1911 and 1920 tracts). I.e., no African-Americans, Asians, or Jews. Ugh! Thank goodness that's in the past.